Norm Riker was named the head women’s soccer coach at Connecticut College in the summer of 2011. Riker compiled an impressive 108-51-25 record as the head coach at Wittenberg University, directing the program to its first four appearances in the NCAA Championship tournament from 2006-2009. 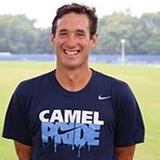 For the second time in the past three years, Riker has directed the Camel women’s soccer program to an appearance in the NCAA Championship. The 2016 squad will carry a 10-5-1 record into their opening round match up against the University of Scranton Saturday, November 12 in Westminster, Md. Under Riker’s direction in 2014, the Camel women’s soccer program made history by capturing the College’s first NESCAC Team Championship, setting a program record with 16 victories along the way. The Camels earned a victory against Swarthmore College in the first round of the NCAA Championship at Montclair, N.J.
Riker’s success on the field can only be rivaled by his team’s efforts in the classroom. The Tigers have received seven NSCAA Team Academic Awards under his tutelage and his teams have consistently carried a mean grade point average of 3.0 or higher. Riker earned a Bachelor of Arts at Springfield College in 1992 and went on to receive a Master of Professional Studies in Education from the State University of New York at New Paltz.